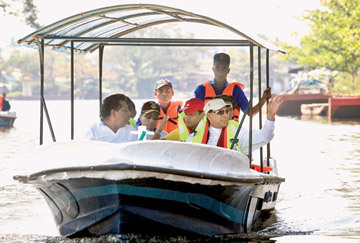 Developing the Hamilton Canal, in Negombo to convert it into a scenic attraction for tourists, commenced last Sunday under the Economic Development Ministry’s Tourism Resources Development Programme. Over Rs. 600 million has been allocated for this project on a proposal by Minister Basil Rajapaksa, under President Mahinda Rajapaksa’s guidance. The project covers a distance of 22 kilometres from Ma Oya to the mouth of the Kelani River as a part of a plan drawn up by the Moratuwa University, for the develop ment of the Negombo tourism region. During the reign of King Vira Parakramabahu VIII in the 15th century, the Negombo Lagoon served as the main seaport for trading in cinnamon and other commodities. According to the GCEC Environmental profile of Muthurajawela and Negombo Lagoon (March 1991), it was this king who had initiated the canal project to facilitate access and transport of goods. The Dutch improved upon it and is presently called the Dutch canal, linking the Kelani River with the Negombo Lagoon to the east of Muturajawela. The canal in its present form was completed during the early British period in 1802. That year the British Revenue and Commerce Agent Garvin Hamilton started a new canal (now named Hamilton) to the east of the earlier Dutch canal which was meant to link the latter with a series of parallel canals. The canal and its vicinity is of much environmental importance since the area is home to different species of fish, birds and plants and rich in bio-diversity, making it ideal for ecotourism.. In view of this, embankments would be built to protect the canal banks and beautify either side of the waterway. In addition, the canal would also be de-silted and steps would be taken to prevent pollution, so that tourists would have the opportunity of travelling by boat from Negombo to places such as Muthurajawela, Kelani Vihara and Danduganna Oya along the Hamilton Canal with no difficulty. Already the first stage of the project is underway with the development of a nine kilometre stretch from Ma Oya to Negombo. The work on the 14 km-distance from the Negombo Lagoon to the mouth of the Kelani River at Hekiththa commenced on Sunday, with the participation of Economic Development Minister Basil Rajapaksa. The work has been undertaken by the Sri Lanka Land Reclamation and Development Corporation. After meeting with the requirements of tourists visiting the area, facilities for fishermen such as marketing stalls and jetties for boats, would be constructed. After the entire project has been completed, the Western Province Tourism Ministry and the Sri Lanka Tourism Development Authority(SLTDA), with the assistance of the people of the area, would jointly supervise the canal's functions.